Brian Parish abandons the Daggers for one weekend and heads off to the delights of Barcelona. About twice a season, Dagenham Dan and I eschew the delights of Dagenham, and board a flight to the Iberian Peninsula to take in a game or three over the course of a weekend. Normally these involve a trip to the Camp Nou to watch Barcelona destroy whichever team happens to be that weeks whipping boys, but this time around we thought we would try something different. Neither of us has yet made it to the new Espanyol stadium, so we decided that a trip to watch them instead was in order. At this point, the flights had already been booked, and it would have cost us the same amount again to cancel and re-book. So, a simple solution presented itself. Namely that we would still travel, but go and watch Espanyol instead, with the hope that we would still be able to fit in another couple of games along the way. So naturally, as the weekend approached, we were back on to the fixture websites, seeing what was in around the city that we could get to. 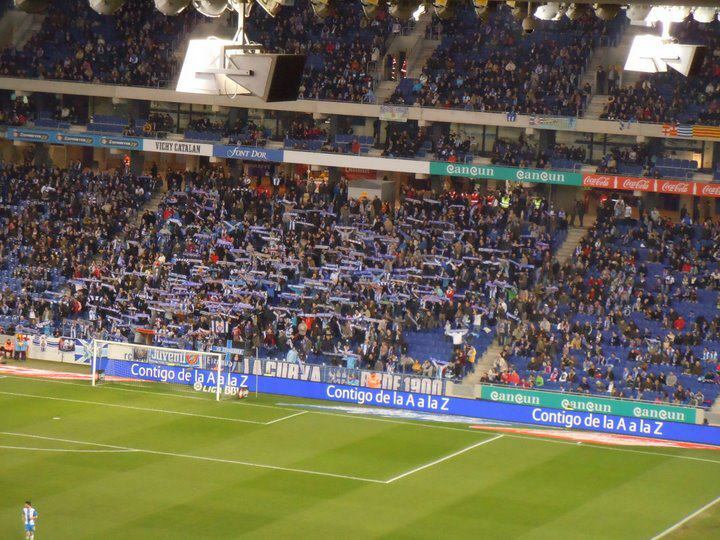 With the Espanyol game being confirmed as a Saturday evening kick off, it meant that we had the whole of Sunday to fit in as many as we could. We had managed to get to three games in a day back in May, so while Dan was confident of at least emulating that, I was a bit more cautious. There have been a few trips planned where we could get to several games, only to have them kick off almost simultaneously, and ruin that idea. 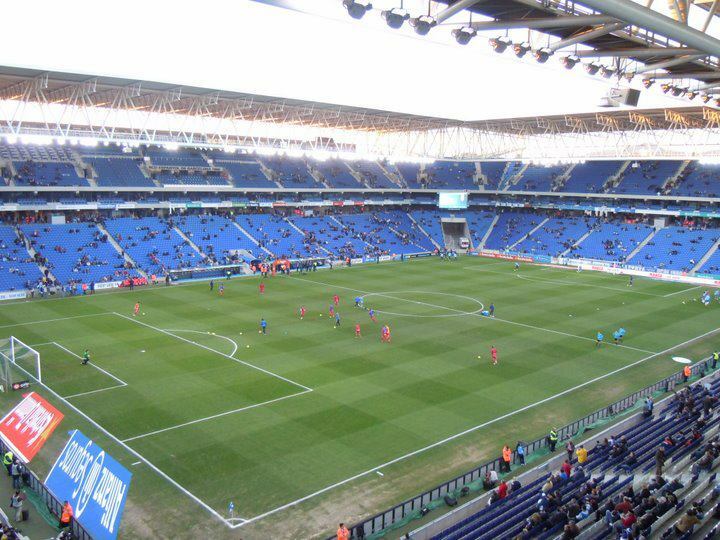 Up until the early nineties, Espanyol played in the city centre, at the Sarria Stadium. This was one of the venues for the 1982 World Cup, and hosted one of the finest games ever played, when Italy beat Brazil 3-2 (thanks to a Paolo Rossi hat-trick) in the second round. From there, the club moved out to the Olympic Stadium, and stayed until about eighteen months ago, when they finally got their own stadium. It’s one of the first “new” stadiums to be built in Spain, and the club are rightly proud of it. Today, the club are unveiling a statue to their former player, Dani Jarque. The statue has been placed just inside the stadium, at gate 21, which was his shirt number. Jarque was the player whose name was emblazoned across the vest of Andres Iniesta, after he had scored the only goal of the 2010 World Cup Final, and the vest is on display on a memorial wall inside the stadium. The fans obviously still have Dani Jarque at the forefront of their thoughts, because twenty one minutes into the game, the whole crowd bursts into a minute’s applause. Both Dan and I look at each other in a state of puzzlement wondering what is going on, before we both realise what is going on; this is a another sign of affection to Jarque. The main noise from the home fans is coming from the opposite end of the stadium to where we are sitting. I have mentioned before about the comparative lack of atmosphere at the Camp Nou, but here that doesn’t seem to be the case. There are two blocks in the lower tier where seemingly every occupant is engaged in the choreographed jumping up and down, or singing. There are also certain chants that involve the whole home support in the stadium, and when everyone is joining in, it makes for a much better atmosphere than down the road in the Camp Nou. Here, there seems to be many more that will join in with the singing than at Barcelona; clearly the current European and World champions are a bigger draw to the visiting tourist, but there feels like there is a greater desire to join in here. Perhaps those that attend the Camp Nou are waiting (or expecting) to be entertained, whereas here, there is a feeling that they should get behind their team in order to inspire them to achieve more. The team must be getting some kind of positive vibe from the fans, because by half time in this one, they are 2-0 up. Just over mid-way through the half they are in front, thanks to a header by Baena which is followed by a penalty (scored by the impressive Verdu) in stoppage time. Granada are competently showing why they are towards the bottom of the division with a fairly toothless display in which they are only creating any kind of opportunity through unforced Espanyol errors. One such mistake allows a lone Granada forward through with a one-on-one opportunity with the home keeper, but his shot is well saved, and that is their best chance of the half gone. In fact, that’s their best chance of the whole game. Four away goals all season will probably tell you all you need to know about Granada on their travels, and with ten minutes to go, Espanyol make it 3-0; Rui Fonte scores after a free kick is not cleared by the Granada defence. For the preceding thirty five minutes they have been the better side and have deserved to increase their lead to a score that goes someway to reflecting their dominance of the game. A crowd of just over twenty six thousand is inside the ground to see this comprehensive win, and once the third is scored, some start to make their way out. As the game peters out to its conclusion, Granada have been lucky to get zero, while this result will see the home side move up to sixth in the division, and just three points from fourth place. If Espanyol continue to pick up points like this, they could be into the Champions League next season. Once the final whistle is blown, the club song is played over the public address system, and we take our last pictures before heading back towards the metro station, which is about fifteen minutes walk away. To let some of the crowds disperse into the night, we head towards a small museum, which contains among other things, a scale model of the new stadium, as well as old players shirts, another tribute to Dani Jarque and a few other pieces of club memorabilia. It’s an interesting few minutes spent in the warm, before we head back out into a rapidly cooling evening. Day two of our trip starts with a trip north of the city to the seaside town of Masnou. With most of the games that we could attend all kicking off at mid-day, we had a choice to make as to which one we would go to. Whereas I would be quite happy to go back to places that we had been before, Dan has this thing about trying to get to as many new grounds as possible. There were a couple of grounds that are near to metro stations that we could get to without too much difficulty, but as it was a nice day we decided to go to the game slightly further away. Having made a trek by the mainline trains to Sabadell in the rain a couple of years ago, it is best to get these games done when the weather is decent, and today, it is certainly that, with temperatures in the high teens, and a clear blue sky. It seems to be a league rule that the pre-match music must consist of as much beat-heavy stuff as you can possibly play; given that the stadium is surrounded by apartment blocks, it must drive the residents nuts when the team pays at home. It’s audible a few minutes down the road, and as we draw near to the ground, we also notice that we will have to walk across a dry river bed to get to the ticket office to purchase our tickets. A gruff, disembodied voice asks for our €12 each, and we are issued with a thin strip of paper that looks like it was run off of someone’s home printer. Just before the teams emerge, the scoreboard operator ambles across the pitch, with his collection of huge numbers for the board tucked under his right arm. As he clambers over the wall and readies himself for action, the away team emerges to a round of applause from those in attendance. Then the home team enters the pitch to the same applause. Finally, the officiating team runs onto the pitch to supreme indifference to the fans. The game is between teams at opposite ends of the table, and it is easy to see why. There are a few yellow cards dished out, but the play is very disjointed, and it is certainly not much to write home about. As we leave the only seated area of the ground at half time, we walk past the tables and chairs of the club bar, where four men are playing dominoes. Clearly the half has not entertained them much. It’s not much better in the second either, with a couple of further cautions, but still nothing to make the bloke with his giant numbers get up and move. The final whistle is blessed relief, and the game ends goal-less. We then have the walk back to the station, and as we approach the crossing outside the station entrance, we can see the train approaching. Dan rushes across the road and legs it into the ticket barriers, thrusting his ticket into the machine. I try the same, but manage to get only a “out” barrier instead. Luckily I manage to get through, and just jump on board as the doors are shutting. It’s a close thing, but for thirty minutes at least, we can relax. Game three is just a few hours away. 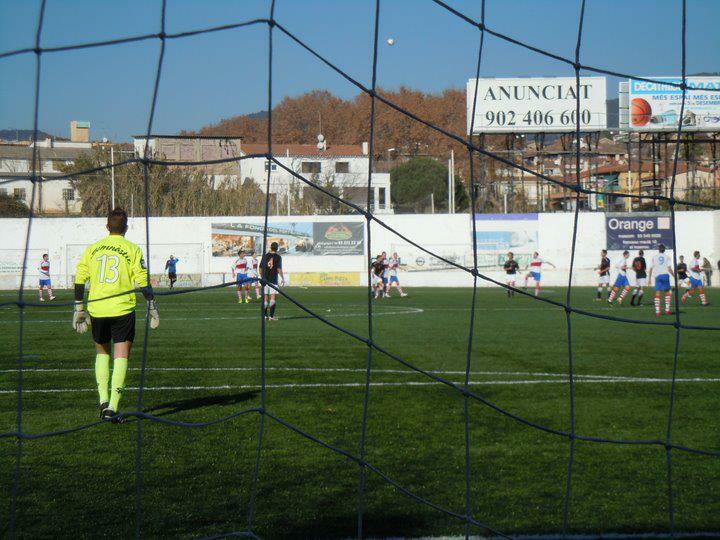 Despite checking every game in the third and fourth division, and even dipping into the two groups that make up the Catalan Premier Division, the kick off times announced meant that we could only get to three games over the course of the weekend. Our quest to get to four games over the course of a Spanish weekend has to be put on hold again, or at least until the next journey out here. Being a bit of a Barca fan, it has been strange not going to Camp Nou on a visit out here, so this is the next best thing. On our last visit to watch the B side last May, they blew a 3-1 lead against Las Palmas to lose 3-5. Tonight though, there are less people here than on that warm May evening; we try to work out the crowd as the game goes on, and reckon that it might be around the 800 mark. It’s a cold evening, and with a 7.45pm kick off, the hats and gloves are already on by the time that the game starts. Barcelona are playing in more or less the same style as the first team, although as you would expect, it’s not quite as slick here. The news has already filtered through that the first team are well on the way to victory in Malaga when the home side take the lead through the impressive Tello. With six minutes to go before half time, he drifts in from the left side of the Xerez penalty area, and curls a right footed shot past the goalkeeper and into the far corner of the net. Barca have been the better side up until this point and they now have the goal to go with their superiority. As Dan disappears at half time, I wonder if these games are being promoted enough through the membership. All current Barca members can get in for free, and bring up to three guests in for €5 each. I accept that this isn’t the first team, and that it can be difficult to get yourself excited to watch a team that actually can’t get promoted any higher than they are now. But even so, it’s still a relatively cheap night out, and you could at least bring the kids along. And this is the second division, not the Spanish equivalent of the Isthmian League. Can you imagine any club in the English second tier getting 800 for a home league game? With an hour played, Barcelona are 2-0 up and the game is as good as done. Another good piece of play by Tello on the left wing results in his low cross eluding everyone and is tapped home at the back post by Rodri. His acrobatic goal celebration is followed by a mass migration to the bench, where everyone joins in with the celebrations. 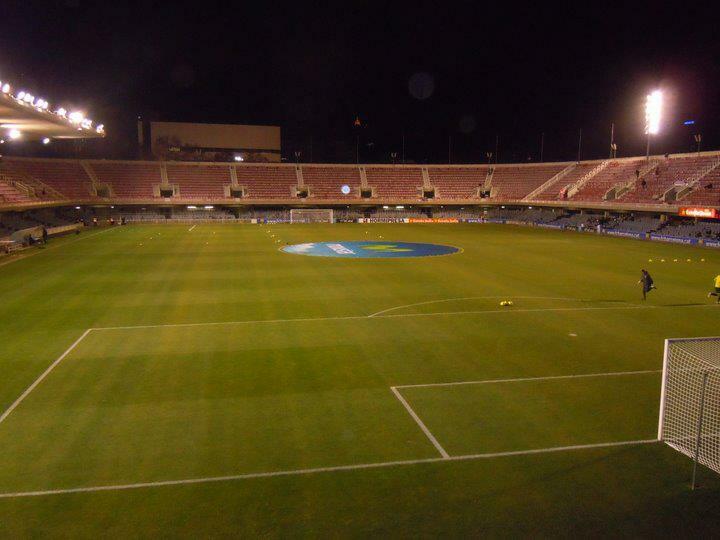 Xerez have never beaten Barcelona B in the mini estadi, and they certainly don’t look like doing it tonight. Which they don’t. By the end of the game, it is still 2-0, and the home side have moved up to 12th following this win. There is enough time for a trip to the golden arches before boarding a train back to our hotel on the other side of the city. While we might not have had the quality of football that we have had on previous trips, it’s still been a good one, and we have at least been to two new grounds. With our next trip into Europe being in five weeks time, at least we don’t have to wait too much longer for our next fix of the beautiful game, continental style. This entry was posted in European Football, Spain and tagged Barcelona, CD Masnou, Espanyol, Granada, La Liga. Bookmark the permalink.